A blistering heat wave has swept across most parts of north and western India, causing massive electricity cuts and leading angry residents to protest and even attack power company officials and property. In the northern state of Uttar Pradesh, enraged citizens have set fire to a power station and held power company employees hostage for several hours. Police said Thursday that at least 21 people have been arrested for the violence and for damaging government property. Uttar Pradesh, home to 190 million people, is India�s most populous state and one of the poorest. Its inadequate energy infrastructure has been unable to cope with the high demand for electricity as temperatures have peaked above 47 C in recent days. The power shortages have left people without air conditioning or fans � and in some cases without water, as electric pumps failed � for hours each day. Uttar Pradesh has only 8,000 megawatts of electricity available against a demand of about 11,000 megawatts, forcing officials to schedule power cuts. People set fire to a power station to protest power cuts in Bahraich, a town 180 kilometres southeast of state capital Lucknow, while in Gorakhpur town, enraged people held power employees captive for more than 18 hours. I doubt that setting fire to power stations will increase the supply of electricity or reduce the price ! Survival in such high temperatures is problematic without electric fans and preferably air conditioning. This will be a growing problem with a growing population and rising temperatures. Despite the uncertainty in future climate-change impacts, it is often assumed that humans would be able to adapt to any possible warming. Here we argue that heat stress imposes a robust upper limit to such adaptation. Peak heat stress, quantified by the wet-bulb temperature TW, is surprisingly similar across diverse climates today. TW never exceeds 31 �C. Any exceedence of 35 �C for extended periods should induce hyperthermia in humans and other mammals, as dissipation of metabolic heat becomes impossible. 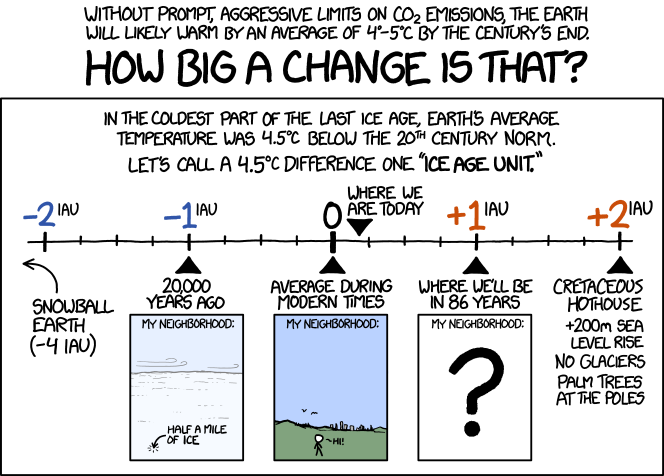 While this never happens now, it would begin to occur with global-mean warming of about 7 �C, calling the habitability of some regions into question. With 11�12 �C warming, such regions would spread to encompass the majority of the human population as currently distributed. Eventual warmings of 12 �C are possible from fossil fuel burning. One implication is that recent estimates of the costs of unmitigated climate change are too low unless the range of possible warming can somehow be narrowed. Heat stress also may help explain trends in the mammalian fossil record. The sorts of temperatures mentioned in Biff's article are almost impossible for most of us here to imagine. Many people get stressed out in the high 20s (particularly if you have to work) and once you're into the 30s, forget it, let alone 40s. It seems that the results of burning fossil fuels - these high temperatures, for instance - means humans want to burn more fossil fuels in response. This is just one dilemma which needs highlighting and remedying. In a similar manner, we have more violent weather, particularly rain, meaning the response of most (western) people is to drive more, rather than walk, cycle or just stay at home. Of course much depends on humidity. the 49 C in Uttter Pradesh was accompanied by pretty low humidity. I wouldn't wish 49�C on any creature, in any humidity. We have of course had heat waves before anyone had heard of climate change, but such events do seem to be increasing in both frequency and severity. As posted above, many of the hottest parts of the world are already very close to the upper limit for human survival, without air conditioning. A reversion of architectural styles is called for with more basements, wind catchers and fountains in courtyard style houses. The basement provides cool air which is drawn up through the house by the windcatcher and the fountain in the courtyard further cools the air. A lack of windows in the outer walls stops the sun penetrating and warming the structure and the contained air. "Primitive" fossil fuel free aircon! They were commonly built throughout the Middle East until the oil age supposedly made them redundant. 49 C is the record for my town. I have seen 45C and that is enough for me. 35C is OK for light work and the house can stay below 30C, my idea of comfort, so long as the temperature is less than about 38C and you get a clear cool night. Once when I lived in another more tropical part of Australia we had 39C and 95% humidity and that made me move to where I am now. On the other hand we also had 5% humidity one day which almost felt like the water was being sucked from your skin especially lips and nostrils. I have been researching passive cooling a lot and got some roof vents which work well if the nights are cool. I have also looked at cooling air by burying pipes in the ground about one metre deep where the temperature is about 23C in summer but felt that mould and condensation would be an issue along with the fact that as I have a small garden it may soon warm up. "hundreds die in heat wave"
This is a hot country normally, and it would appear that only a slight increase in temperatures is fatal for s significant minority. The information given here on fans and cooling houses is wrong! They assume that the temperature inside a house is always higher than outside which is just not the case. With older brick, cob and stone houses and with modern high thermal mass houses the inside of the house will often be cooler than outside and so the windows should be shut during the day to keep the hot air outside. Fans can be used during the day to circulate the air inside the house only to increase cooling but this shouldn't be necessary all that often. Windows on the south, but especially on the east and west elevations, should be shaded on the outside to stop the sun from penetrating into the building. East and west facing windows will let the low early morning and late evening sun penetrate the house and warm it but the high sun over the middle of the day will only penetrate a little way into the house unless the window is full depth. So south facing patio doors, for example, should be shaded. At night, when the outside air has cooled down, windows can be opened and cool air can be blown into the house to cool the thermal mass down for the next day. As soon as the outside air starts to heat up the windows should be closed tight! In short, if the outside is hotter than the inside then close your windows but if the inside is hotter than the outside open them. It might seem counter intuitive but it works. This won't work in lightweight and timber framed houses, unfortunately, as they don't have enough thermal mass to keep cool throughout the day although it can work for part of the day. It depends on the thermal mass of the house. If you need to ventilate your house during the day try to open windows/doors on the ground floor on the north, cooler, side of the house and the upper windows on the south side. This will draw cooler air into the house from the north side. Good advice Ken. The downside is that it only applies for two days a year in England. If only, Biff. If only!!! Well, we've had the Rayburn lit all day. High of 10 degrees here today!